"The Energy in this room is fantastic", Dave Holland remarked to the crowd gathered for the third show put on by The Shape of Jazz to Come project. 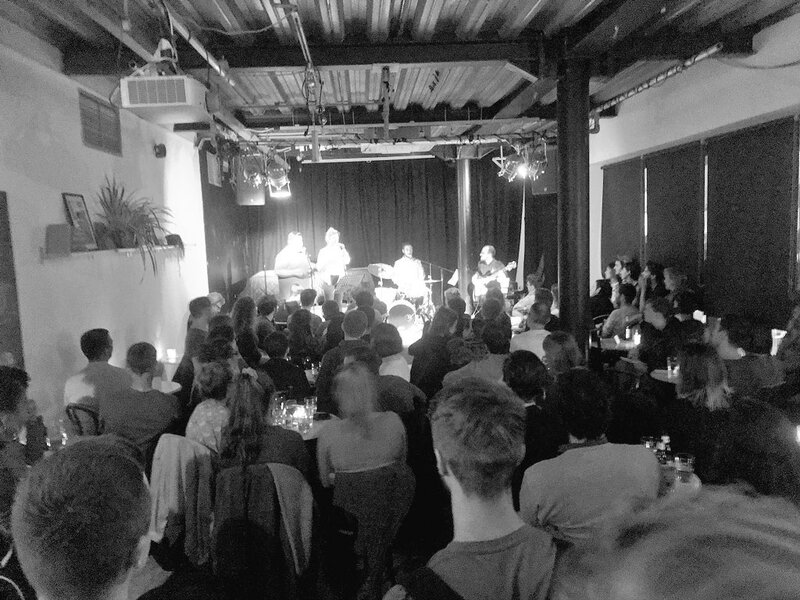 Supported by the Dave Holland and Evan Parker fund, in collaboration with the Vortex, the night is a recent addition to the club’s regular rota. Referencing Ornette Coleman's ground-breaking 1959 album of the same name, the endowment aims to shine a light on some of today’s talented young artists. I spoke to Dave Holland before the show about "The Shape of Jazz to come". He told me that the idea is "to give a platform to young musicians who are looking to build up their audience and to give them some exposure in London" and "to start to generate a little bit more awareness in the younger generation of the club itself." The fund was started in February with successful fundraising shows at the Vortex featuring Holland and Parker. The pair's support for the Vortex comes from their appreciation of the importance of venues "in London in the 60's" that allowed them to "develop and learn the music" and gave them a place to play. Holland and Parker feel that the Vortex is "an ideal venue to host this project." Although the fund is still in its early stages there is a lot going on in the next few months, from a show featuring Ms Maurice to a two day festival in December (Details and links can be found below). Monday night’s performance featured two exciting new bands; Nima, the September Guildhall School of Music student band, fresh from their sold-out show at the Edinburgh Jazz Festival, and Forj, "The Shape of Jazz to come's" pick, led by drummer Jonathan Silk. Forj's set was a wild, muscular delight. With Josh Arcoleo's powerful, raspy tenor sax tone punching through the air in his solos on tracks like Forj and Replicate. Joe Wright’s light, breathy sound balanced out the saxophone duo's ensemble moments, then opened up into wistful, running solos on numbers such as Mirrors and The Consequence. The rhythm section, consisting of Nick Jurd on bass and Jonathan Silk on drum kit, was devilishly tight. Jurd sensitively bridging the gap between percussion, harmony and melody on tunes like Mirrors and Replicate, alternating between unison sections with the saxes and sharp, angular grooves with Silk. Leading from the rear of the stage, Silk directed the band with poise, never overwhelming the saxes or bass but steering the group through the various feels, grooves and effects that they explored. The first set was played by Nima. Led by vocalist Luca Manning, the group explored standards, pop arrangements and Brazilian traditional songs with remarkable originality. Seth Tackaberry's lyrical yet harmonically grounded bass playing, often chordal and highly dexterous, held the group together. On tracks such as Bye, Bye Blackbird, Petite Fleur and It's been so long, he set out the harmony subtly at the same time as effortlessly creating smooth grooves with Sam Every on kit. A funky arraignment of Come Together allowed Every and Tackaberry to stretch out with impressive fills and a tight groove. Sharing the vocal responsibilities in the set were Manning and Irini Arabatzi. With their impressive solo numbers, Arabatzi on Forró Brasil and Manning on Overjoyed, and intertwining harmonies on tracks like My Oh My and Come together, the standard of musicianship was clear. What stood out most about the set was the joy with which the musicians, and the crowd, interacted with the music. The support shown by the audience was lovely to see. Dave Holland remarked in his introduction of the gig to the audience that the night was about bringing together new music and musicians as well as creating a community to support them. From what I saw and heard everything is going to plan in a spectacular fashion.